When I lived in New York City, one of my favorite restaurants—when I could afford it—was the original Le Cirque on East 65th Street. The name Le Cirque means “the circus” in French, and it’s an appropriate moniker for Sirio Maccioni’s flagship restaurant, with its bold and vibrant Fellini-esque décor featuring circus balls, tent shades, monkeys, balloons and such, along with what was often a circus-like atmosphere to match the surroundings. For four decades, Maccioni has been warmly greeting customers old and new to Le Cirque, whether they be president, pope, runway model, movie star, professional athlete or just a food writer from Utah. I’m prefacing this review with a mention of the renowned Maccioni because Valter Nassi—executive chef and partner in Valter’s Osteria—seems to have taken a page out of the Maccioni playbook, and his restaurant is about as close as you’ll get to Le Cirque in Utah. Yes, there’s the temptation to say that the ambiance at Valter’s Osteria is circus-like. But hey, lots of people love the circus. Every circus needs an impresario—a ringmaster—and Nassi is nothing if not that. As with Maccioni at Le Cirque, the Italy-born Nassi bounces from table to table at his restaurant, always looking the bon vivant in a well-tailored suit—greeting and wooing customers, kissing women’s hands and hugging the men. Like Maccioni, he can make brand-new diners feel like family, which is one reason his restaurant is busy even on a weeknight. Although not everyone loves Nassi’s shtick, those who do are very loyal, and many followed him from Cucina Toscana to his namesake eatery. People who suffer from haphephobia—the fear of being touched—would be well-advised to dine elsewhere. Located in the space that previously housed the award-winning Metropolitan restaurant, Valter’s Osteria reflects Nassi’s personality: vibrant and buzzing. The ambiance is much lighter than at Metropolitan—literally, since the wall of windows that was covered up on the east side of the restaurant has been opened to allow natural light to flow. Tables are a bit crammed together, but that just helps to generate the bustling vibe of an authentic Italian osteria, where you’ll probably become fast friends with the folks dining next to you. Given the nifty makeover of the restaurant space, and tables adorned with crisp white linens and fresh flowers, it seems a bit unusual that the menu comes bound in construction paper. While perusing the menu and its nearly overwhelming array of options, a simple dish of bruschetta arrives: grilled rustic bread slices topped with diced tomato and fresh basil, with Valter’s own rich and robust signature extra-virgin olive oil for dipping. One could make a meal of nibbling on the antipasti selections from the menu, which includes Caprese salad ($12.50), prosciutto-wrapped cantaloupe melon ($18), fennel-crusted duck breast with baked pear, plums and housemade truffled duck pâté ($15), or luscious carpaccio di tonno ($14), which is thin-sliced sushi-grade tuna with arugula. My favorite antipasti at Valter’s, however, is the carpaccio di bue ($15). It’s a plate of raw beef tenderloin shaved so thin you can almost see through it, topped with arugula, Parmigiano-Reggiano cheese and sliced mushrooms. The only way to make this dish better would be to add truffles, and Nassi is keen to oblige. 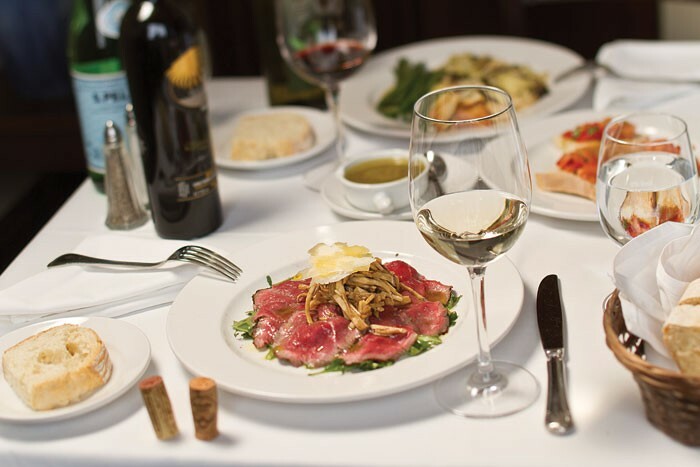 He’s definitely a “hands-on” owner, and stopped at our table to personally drizzle lemon juice onto our carpaccio and to offer a generous accoutrement of shaved black truffles. Use caution when saying “yes” to such upgrades, however, as they’re likely to appear on your bill. If you were familiar with and enjoyed Cucina Toscana’s menu during Nassi’s reign there, his osteria offerings will fit like a comfortable pair of worn sneakers. There are many of the same pastas, soups, salads and entrees—can’t-miss dishes like housemade four-cheese ravioli with cream sauce and asparagus ($24), housemade potato gnocchi in a mushroom-cream sauce ($24), escolar with brandy, capers and a trio of mustards ($32), and Nassi’s signature piccata-style chicken: organic chicken breast from Tecumseh Farms sauteed with lemon juice, caper berries and oyster mushrooms, accompanied by risotto in lemon-butter sauce ($24). I was happy when our server warned us that the risotto would take 25 minutes or so to prepare because that meant it was made from scratch, which not many restaurants take the time to do. A staple at Valter’s—and a dish I just can’t get enough of—is linguine alle vongole ($24), known to English speakers as linguine with clam sauce. It’s a large bowl of linguine cooked al dente with about a dozen fresh clams, snippets of basil, a smidgeon of onion and a silky, nearly sensuous seafood reduction sauce. It’s the type of dish—like the lasagna with Nassi’s mother’s meat sauce—that, while not breaking down any culinary doors, tastes fresh and new each time. Maybe that’s the secret to Valter’s: consistency. As food fads come and go, Nassi sticks to the classics, never apologizing for his scaloppini di vitello or the pasta e fagioli. Another constant at Valter’s is the man himself. I don’t think he ever takes a day off, and he seems to gain energy the busier his restaurant is—hustling to offer freshly ground Parmigiano-Reggiano to a dish here, shaving truffles onto a plate there, or helping assemble a Caesar salad tableside. Dining at Valter’s Osteria is like attending a symphony with a world-class maestro at the helm. This is Valter’s world; we just eat in it.